Since 2003, NYC’s Talibam! have been charting a course through the improv waters in a way that few other groups can pull off. Rock, jazz, noise and all stops in between collide in an aggressive mix that defines free music in the best sense of the term: nothing is deemed out of bounds. 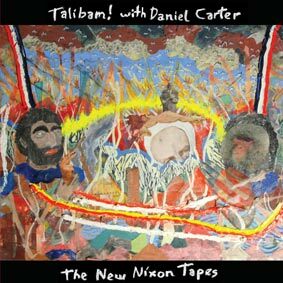 Too much fun to be a po-faced postmodern exercise, and too expertly played to be sunk in a morass of good intentions, The New Nixon Tapes hurtles through two side-long pieces in an agile cascade of rhythmic and melodic ideas. Kevin Shea (drums) and Matt Mottel (synthesizer) have worked with Cooper-Moore and Rhys Chatham, among others; here they’re joined by master saxophonist / trumpeter / flautist Daniel Carter. Recorded live in the WFMU studios. Digital download coupon included.